Do you still have some gifts to give out in the New Year? Or, are you looking for a simple, yet elegant, treat to make for yourself and your family after all the hectic holidays? I know for me, this was a CRAZY holiday season… too much work, organizing, and stuff to get done in such a short period of time! These chocolate ganache truffles are really simple to make, but are an unexpected indulgent treat in the winding down of the holiday season…. either for yourself, or as a gift to friends or family. My favorite thing about this recipe is that it is so adaptable to your individual preferences – and you can use whatever flavorings/ingredients you have lying around in your pantry. The other thing that I like about this recipe is that you can divide it to make three different flavors all at the same time. 1. First, make the ganache. Finely chop the chocolate into even chocolate chip sized pieces (or just cheat, and do what I do – but high quality chocolate chips and use those instead. I like the Ghirardelli bittersweet 60% chocolate chips). 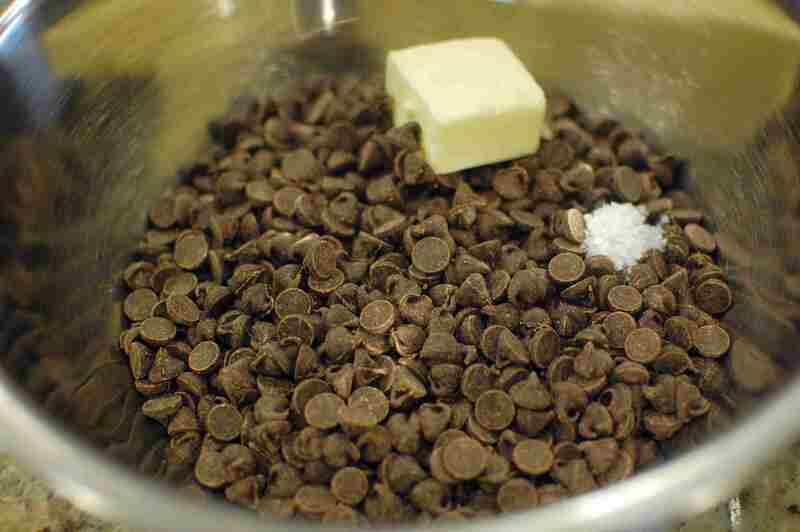 Put the chocolate into the bottom of a heat-proof bowl, add the butter and salt. 2. 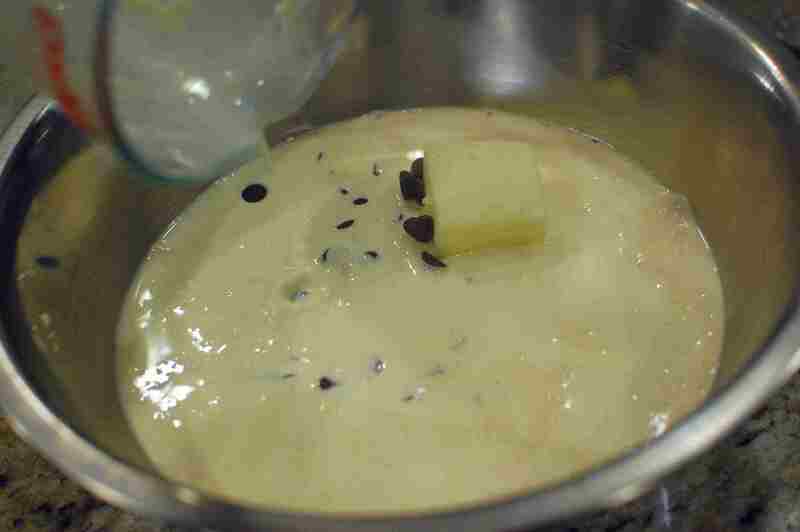 In a large pyrex measuring cup, microwave the cream for about 4-5 minutes until very hot. Pour the hot cream over the chocolate chips, and allow the mixture to sit (undisturbed) for 6 minutes. 3. After 6 minutes, begin to stir the mixture with a wire whisk. 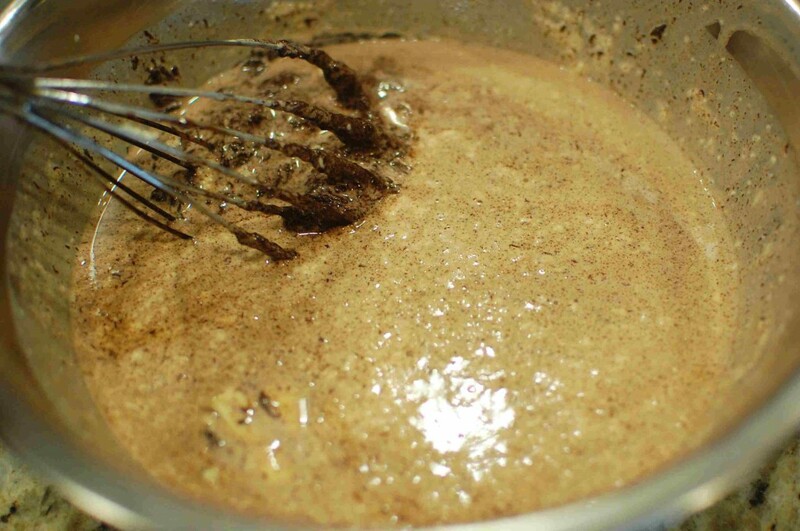 The mixture will appear lumpy and grainy at first – don’t worry, just keep on whisking. 4. 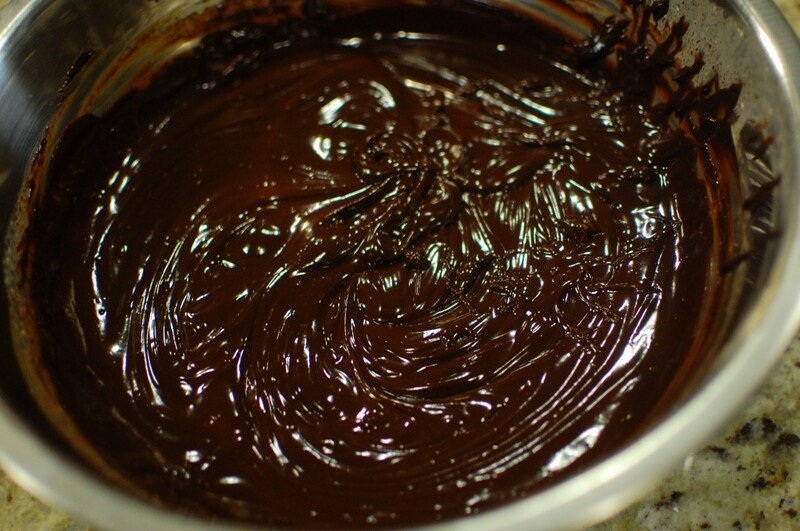 Eventually the mixture will come together into a shiny & smooth ganache. 6. Refrigerate for 3 hours until cold and stiffened. 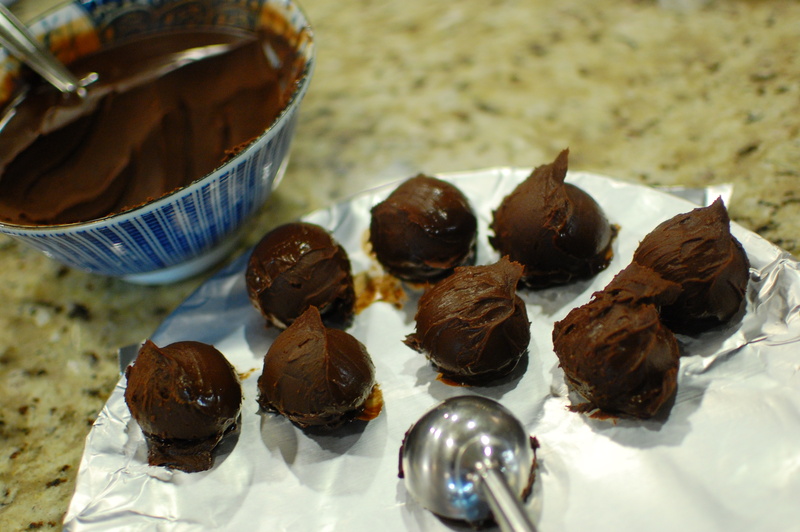 Scoop the ganache into 1-2 T. truffle sized balls. 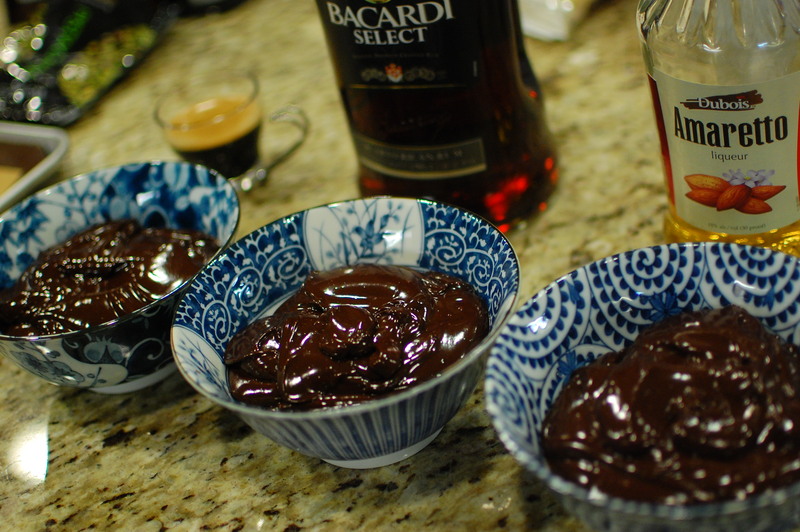 I like to use a cookie scoop because it minimizes the handling of the ganache, which will melt if you over-handle. Put the balls in the freezer for 10 – 20 minutes to firm up. 7. 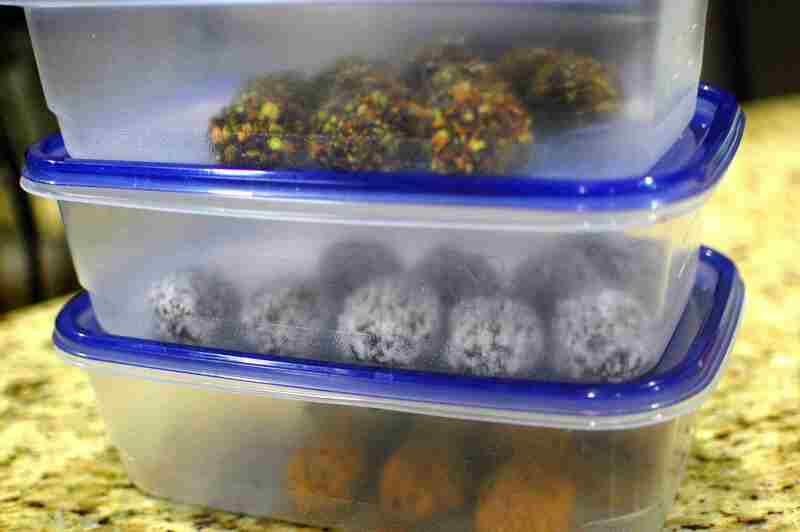 Remove the balls from the freezer (I like to do this in batches, one flavor at a time), and coat. To coat, roll the balls into your desired toppings. For the espresso flavored truffles, I rolled in unsweetened cocoa powder. 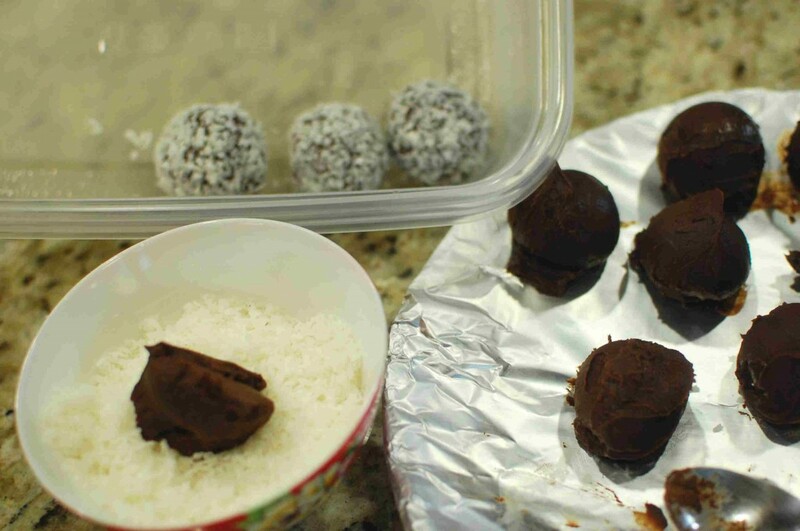 For the Rum truffles, I rolled in pulverized shredded coconut (just put regular shredded coconut into the food processor for a few seconds to break down into smaller pieces). 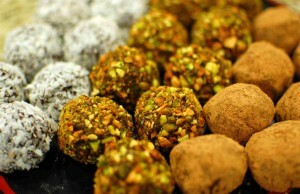 For the orange-Amaretto truffles, I rolled in finely chopped pistachio. 8. Store in a closed plastic container. These will keep longer if refrigerated, but will last several days unrefrigerated. I tried making this for a friend’s birthday but the ganache ended up too thin. Is there anything I can do next time to keep this from happening? Ganache will harden as you cool it. Just cool it longer. Also make sure you are using real chocolate (not “white chocolate”) – ganache recipes don’t work at all if you are not using proper chocolate. Milk chocolate may also produce subpar results. You can use anything from semi-sweet chocolate to dark chocolate.